Couple of years ago when I played the game called Civilization, I still remember that as a leader of a nation, I have to make sure that all my people are happy. To achieve that goal, I have to make sure that my country is one of the most advanced civilization in the world by improving the research and building wonders of the world. Another way is by improving luxuries trade. In order to do that I have to conquer rich soil or make trade agreement with other nations. In 2006, Adrian White, an analytic social psychologist at the University's School of Psychology, analysed data published by numerous international organization to create a global projection of subjective well-being: the first world map of happiness. This analysis is based on the research of over 100 different studies around the world, which involved 80,000 people worldwide. The result put Denmark as the happiest nation in the world right now. 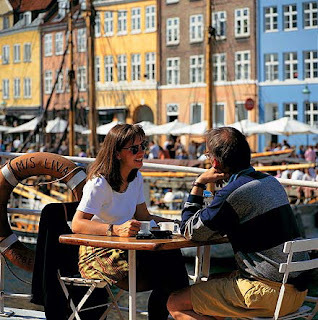 Why are Danes the world's happiest nation? Firstly, winning the 1992 European Football Championship put Danes in such a state of euphoria that the country has not been the same since. This may explain the high level of life satisfaction in Denmark after 1992, they write. Secondly, while Danes are very satisfied, their expectations for the coming year are rather low. In contrast, Italy and Greece, which rank low on life satisfaction, rank high on expectations for the year to come, together with Swedes and Finns. The causes of the stolid depth of Danish wellbeing are undoubtedly multifactorial, they say. The Danish football triumph of 1992 has had a lasting impact, but the satisfaction of the Danes began well before 1992, albeit at a more moderate level. The key factor that explains this, and that differentiates Danes from Swedes and Finns, seems to be that Danes have consistently low (and realistic) expectations for the year to come. So the key to happiness may lie in the fact that if you lower your expectations enough you might feel a bit better next Christmas, they conclude. What about Indonesia? According to the research from Erasmus University Rotterdam on this website, Indonesia rank number 38 in the list with the scale of life satisfaction goes to 6.6 out of 10. Get confused? It's because they only take one Indonesian as their sample, ha ha ha.